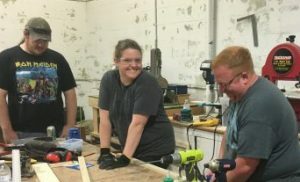 Volunteers are what makes everything work at Lansing Makers Network. Without the dedicated makers in our community who support us as a community resource for learning together and making amazing things, the space simply wouldn't exist. Whatever your skill level, there are ways to get involved as a volunteer. Check out the opportunities below, and don't hesitate to contact us for more information! Work with a staff person assisting classes, improving areas at the makerspace, staffing open hours or helping out at special events. 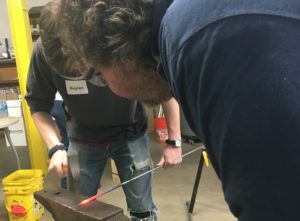 Volunteers can accumulate hours toward the purchase of a volunteer membership at Lansing Makers Network. 10 volunteer hours can be used to purchase a monthly $35 volunteer membership. Hours must be approved in advance with an area manager or staff person. Once volunteer hours are used to purchase a volunteer membership, those hours are "consumed" and can't be used again. Volunteers may prearrange to transfer their volunteer hours to another person. We do our best to match volunteers to available opportunities, but there is no guarantee that hours will always be available. All volunteer memberships are monthly (no quarterly or yearly memberships are available). Volunteer membership are not eligible for "add-on" family memberships. Most volunteer opportunities require the completion of a volunteer orientation (this counts toward your hours total). Volunteer hours expire after 1 year if not used. Volunteer Staff positions are defined positions at the makerspace with a job description and on-going responsibilities. Volunteer Staff are provided a gratis membership to Lansing Makers Network for their service. If you're looking to get involved helping organize the future of Lansing Makers Network, take a look at our open positions. These positions generally require prior experience or other specialized skills, but for many positions training or mentor-ship is available. Details on how to apply are in each posting. Below are the current volunteer staff openings at Lansing Makers Network. Follow the links for descriptions and information on how to apply to join our makerspace team!